Screen printing, sometimes called silk screening, is most commonly used on t-shirts and sweatshirts when embroidery would be impractical and expensive. 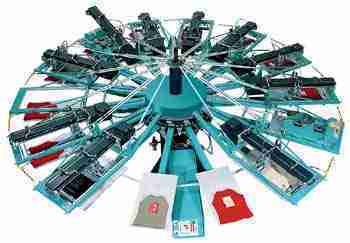 It is usually more cost effective to screen print than embroider where designs are very large and quantities are high. Once artwork has been aproved screens are made for each colour with a mono filament mesh. The screen is coated with photopolymer liquid emulsion and allowed to dry and harden. The stencil is made in the screen by placing a positive of the print over the coated screen then exposing the screen to light. The areas of the screen shielded from the light remain water soluble and can be washed out of the screen. As screens need to be made for each colour in the print set-up can be expensive which is why screen printing is most suited to larger quantities. If you’d like to enquire about screen printing please do not hesitate to get in contact.